Tonight, Thursday, Nov. 17, the International Pool Tour’s first event, the “IPT World 8-Ball Championship,” will be showcased on a special one-hour edition of Fox Sports Net’s “Best Damn Sports Show Period.” The match was an exhibition-style 8-ball contest between Hall-of-Famers Mike Sigel and Loree Jon Jones, held at Mandaly Bay Resort and Casino in Las Vegas, Nev, in August. The show will be broadcast at 10:30pm local time on FSN – check your local listing for availability. In addition to the national airing on FSN at 10:30, the event will also be shown tonight on a number of FSN’s regional sports channels at 9pm and 11:30pm, according to the IPT’s press release. According to the IPT’s press release, FSN reaches more than 81 million homes nationwide. “We look forward to this event attracting more than just billiard fans,” George Greenberg, Executive Vice-President of Programming and Production at FSN, told the IPT. Sigel and Jones are scheduled to make appearances on the “Best Damn Sports Show Period” in the days leading up the to Nov. 17th broadcast date. In addition to the national airing at 10:30 pm, the IPT World 8-Ball Championship will also be shown on the same date on a number of FSN’s regional sports channels at 9 pm and 11:30 pm. Mike Sigel leaned on his experience to secure pool’s biggest bundle. For one of the few times in his pool career, Mike Sigel was left overwhelmed and speechless following his straight-sets, 9-2, 9-2 win over Loree Jon Jones in the first International Pool Tour World 8-Ball Championship at Mandalay Bay Hotel & Casino in Las Vegas Saturday evening. 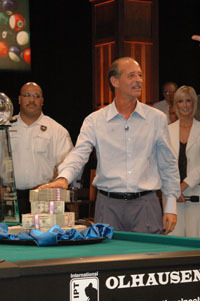 Presented with bundles of cash that totaled a highest-ever $150,000 top prize, Sigel tried to put the moment into words. The only thing that came out, however, were tears. “Six weeks of practice, and all the hype, and what this means for pool, it was too much,” said Sigel of the much-anticipated “battle of the sexes” head-to-head match. Jones, who admittedly was no match for her own nerves, still received a tidy $75,000 paycheck for the afternoon’s work. The Sigel-Jones match will serve as the launching pad for bigger and more elaborate events for pro pool in the future, according to entrepreneur/promoter Kevin Trudeau. As expected, both players were shaky at the start of the match, played in an elaborate arena setting and witnessed by 500-plus fans, including numerous sports and entertainment celebrities. Jones missed several chances to put pressure on Sigel, who rolled off from a 3-2 lead to a 9-2 first-set win. In the second set, a relaxed Sigel played more to expectations, while Jones again missed several critical shots. Who is the man behind this weekend’s $225,000 Battle of the Legends match between hall of famers Mike Sigel and Loree Jon Jones? It’s millionaire entrepreneur Kevin Trudeau … the informercial pioneer and author of The New York Times bestseller, “Natural Cures.” And Trudeau’s grand plan for pool extends well beyond Saturday’s marquee match-up at Mandalay Bay in Las Vegas. Trudeau’s International Pool Tour is the buzz of the pool world. Tonight at 8:00 p.m. EST, Trudeau will be live on “BD Live Chat,” answering YOUR questions about Saturday’s big match, the IPT, his formula for bringing pool into the big time, and why 8-ball is pool’s future. The BD Live Chat room will open at 7:30 p.m. EST to give users an opportunity to begin posting questions. TONIGHT – Live Chat With Mike Sigel! Get your questions ready – Tonight’s your chance to talk online with Mike Sigel! Just click the red button above! In advance of their epic $225,000 face-off in Las Vegas, Aug. 20, Loree Jon Jones and Mike Sigel, as well as promoter Kevin Trudeau, are sharing their thoughts on the Battle of the Legends showdown LIVE on BilliardsDigest.com this week. TONIGHT, (Aug. 17th) at 8pm EST, nine-time world champ Mike Sigel will offer his opinions and answers questions from site visitors. Each night visitors can log on at 7:30 EST and begin submitting questions for that night’s visitor. Tonight, Mike will join the chat at 8pm EST, and he’ll be online with us for about an hour. The red button above will take you to the BD Live Chat page. Last night’s guest was Loree Jon Jones; Kevin Trudeau will answer questions this Thursday (Aug. 18) at 8pm EST. Loree Jon Jones LIVE Chat Tonight! Tonight’s your chance to chat with Loree Jon Jones! Just click the red button above! In advance of their epic $225,000 face-off in Las Vegas, Aug. 20, Loree Jon Jones and Mike Sigel, as well as promoter Kevin Trudeau, will share their thoughts on the Battle of the Legends showdown LIVE on BilliardsDigest.com this week. BilliardsDigest.com will feature live chats on three separate nights leading up to the mega-match. Eight-time world champion and Billiard Congress of America Hall of Famer Jones will offer her views and answer questions from site visitors TONIGHT, (Aug. 16th) at 8pm EST. Sigel will be online tomorrow (Wednesday Aug. 17) at 8pm EST, and Kevin Trudeau will answer questions this Thursday (Aug. 18) at 8pm EST. Each night visitors can log on at 7:30 EST and begin submitting questions for that night’s visitor. The red button (above) on the BD home page will direct visitors to the BD Live Chat page. Bring on the Hype! In advance of their epic $225,000 face-off in Las Vegas, Aug. 20, Loree Jon Jones and Mike Sigel, as well as promoter Kevin Trudeau, will share their thoughts on the Battle of the Legends showdown LIVE on BilliardsDigest.com next week. BilliardsDigest.com will feature live chats on three separate nights leading up to the mega-match. Eight-time world champion and Billiard Congress of America Hall of Famer Jones will offer her views and answer questions from site visitors on Tuesday (8pm EST). Sigel, nine times world champion and also a BCA Hall of Famer, will surely bring his A game to the BD site on Wednesday (8pm EST). And Kevin Trudeau will talk about his involvement in pool and his grand plans for the International Pool Tour on Thursday (8pm EST). Each night visitors can log on at 7:30 EST and begin submitting questions for that night’s visitor. A button on the BD home page will direct visitors to the BD Live Chat page.